Größe dieser Vorschau: 600 × 600 Pixel. Weitere Auflösungen: 240 × 240 Pixel | 480 × 480 Pixel | 768 × 768 Pixel | 1.024 × 1.024 Pixel | 1.800 × 1.800 Pixel. 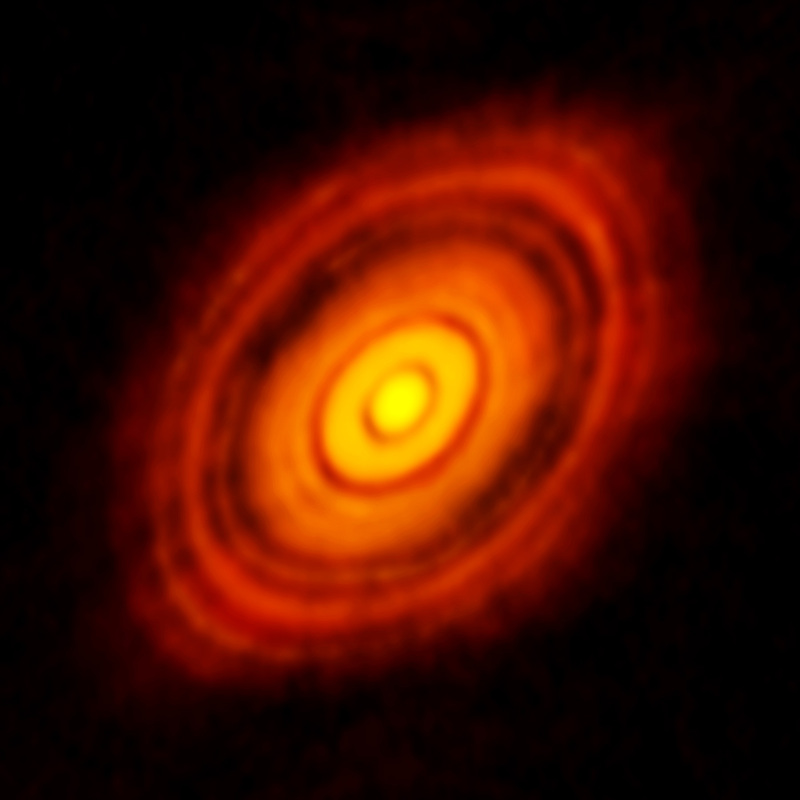 English: ALMA image of the protoplanetary disc around HL Tauri - This is the sharpest image ever taken by ALMA — sharper than is routinely achieved in visible light with the NASA/ESA Hubble Space Telescope. It shows the protoplanetary disc surrounding the young star HL Tauri. These new ALMA observations reveal substructures within the disc that have never been seen before and even show the possible positions of planets forming in the dark patches within the system. Position (Dec): 18° 14' 0.99"
This image was produced by the ALMA Observatory. Unless specifically noted, the images and videos distributed from the public ALMA websites (www.almaobservatory.org, www.alma.cl, and kids.alma.cl) along with the texts of press releases, announcements, pictures of the week and captions, are licensed under a Creative Commons Attribution 4.0 International License, and may on a non-exclusive basis be reproduced without fee provided the credit is clear and visible. Details on how to interpret this are given below for those who need further explanation. See the ALMA copyright notice for complete information. If you want to use our materials without having to pay, the full image or footage credit must be presented in a clear and readable manner to all users, with the wording unaltered (for example: "Ralph Bennett – ALMA (ESO/NAOJ/NRAO)". The credit should not be hidden or disassociated from the image footage. Links should be active if the credit is online. See the copyright Q&A section on this page for guidance. The text of press releases, announcements, pictures of the week and captions should be credited to ALMA, except when used by media. ALMA materials, images and videos may not be used to state or imply the endorsement by ALMA or any ALMA employee, or ALMA partner (ESO, NRAO, or NAOJ) of a commercial product or service. We welcome a copy of the product sent to us to be indexed in our archive. Please send it to copyright alma.cl. Note that this general permission does not extend to the use of ALMA's logo, which shall remain protected and may not be used or reproduced without prior and individual written consent of ALMA. Owners of external websites wishing to link to the ALMA web site may use ALMA's logo for the link, provided they have obtained prior authorization from the ALMA Education and Public Outreach Department and on the condition that such use is clearly identifiable as a web link. Also note that music, scientific papers, code, and text other than press releases, announcements, pictures of the week and captions on this site are not released under the Creative Commons Attribution 4.0 International License and cannot be used for non-ALMA products. By reproducing ALMA material, in part or in full, the user acknowledges the terms on which such use is permitted. Diese Datei, die ursprünglich auf http://www.eso.org/public/images/eso1436a/ veröffentlicht wurde, wurde am 1. Oktober 2018 vom Administrator oder vertrauenswürdigen Benutzer Huntster geprüft, welcher bestätigt, dass die Datei am angegebenen Tag unter der genannten Lizenz verfügbar war. aktuell 03:53, 8. Nov. 2014 1.800 × 1.800 (241 KB) Huntster Larger size from European Southern Observatory. This is the sharpest image ever taken by ALMA— sharper than is routinely achieved in visible light with the NASA/ESA Hubble Space Telescope. It shows the protoplanetary disc surrounding the young star HL Tauri. These new ALMA observations reveal substructures within the disc that have never been seen before and even show the possible positions of planets forming in the dark patches within the system.